Being a college girl means we don’t have too much time to work or let alone get ready for class but what about the weekends when we want to let out the stress from all the work week and maybe even get ready for once? College takes a lot of time out of your week which makes it hard to work which means were all on a budget and maybe can’t afford those high-end brands and want to stick to those good Target finds. Today, we are going to be comparing drug store foundation to higher end foundations to see if spending all that extra hard-earned money is worth packing on the debt after graduation. Sephora is a holy grail walking through the aisles of name brand products. Walking past Urban Decay, Laura Mercier, and Yves Saint Laurent might make your credit card run and hide, but when you buy high end, it’s meant to last you longer and give you that coverage every girl dreams of. Fenty Beauty is the hottest thing on the market to get your hands on. I was one of the lucky ones that purchased it the day it came out. Rihanna is not just an icon in the music world, she is now becoming a staple to the cosmetic world as well. Fenty Beauty came out with 40 different foundation shades meant for every girl of every complexion. Her foundation runs 34 dollars, which is on the cheaper side of a higher end foundation. This foundation gives you buildable full coverage as if you have an Instagram filter on your face. If you can get your hands on this life changing high-end foundation, I would definitely recommend it. A dupe for this would be the Fit Me foundation by Maybelline. Fit me will give you that coverage, and its only six dollars. Urban Decay all-nighter which runs for about 40 dollars is a foundation that is a full coverage, and matte. It lasts all day and you can wear it for an everyday look without looking overly done up for that 10 a.m. lecture. Urban Decay All Nighter foundation is the definition of a little bit goes along way. This product myself has lasted me about a year. It’s worth the price if you like something more on the high-end side of things. A nice dupe for this would-be Photo Focus foundation by Wet n’ Wild for only six dollars! 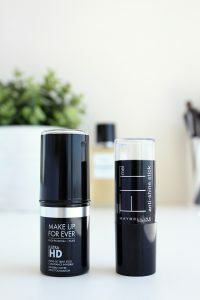 If you don’t mind spending a little bit more, and get that air brushed look you’ve been dreaming of, get ready with the Laura Mercier Flawless Fusion Ultra-Longwear Foundation that runs for 48 dollars. This foundation is for all skin types from oily, to combination skin. This foundation is matte finish, with a buildable 15-hour wear. A wonderful, hands down holy grail dupe for this is the Loreal Infallible foundation for 12 dollars! Being a college girl makes life busy but one thing we should never be too busy for is feeling confident in ourselves. If you can afford Fenty, Urban Decay, and even Yves Saint Laurent, then you run to Sephora. If you’re more of a Target girl, that’s fine too! Grab that Maybelline, and Wet n’ Wild. 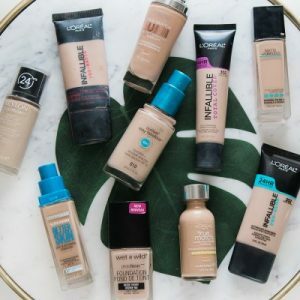 When it comes to foundation and makeup in general, it doesn’t matter how much you spend. What matters most is how you feel, and the confidence you get while you rock your new look.